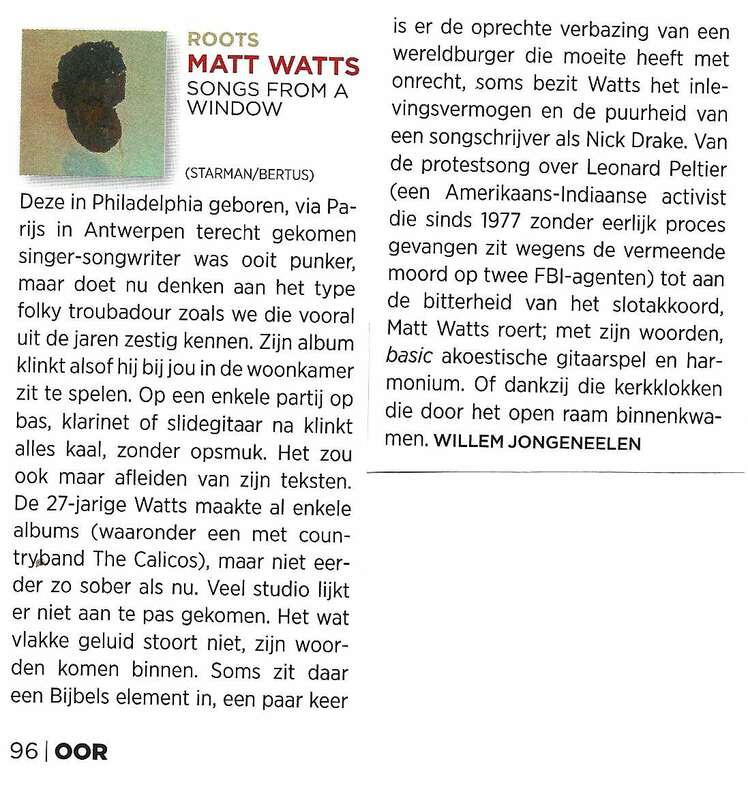 Matt Watts (°1987) is an American folk singer born in Philadelphia, Pennsylvania to a spiritual family with Cherokee roots. Since arriving in Antwerp, Belgium at the age of nineteen he has become a folk singer in his own write. He has worked with many artists, poets and writers. Most notably Jan Verstraeten (Charlie Jones), Max Temmerman (Winner of the Herman De Coninck Publieksprijs 2013), Staf Verbeeck (Deus, Calexico), Fritz Sunderman (Axelle Red, Bobbejaan), the American Science Fiction writer S. Morgan Balkcom and shared a bill with many performers and groups in the US and Europe. Most recently Simon Joyner & The Ghosts, Marc Ford (The Black Crowes) and Belgian groups Erikson Delcroix (Zita Swoon, Lais), Dans Dans (The Flying Horseman, Strand), Roland Van Campenhout, Charlie Jones’ Big Band, Stanton (Jim White, Brazzavile) and Winther among many others. "Songs From A Window" is an intensive and pure album recorded in the early folk traditon. Relying solely on timbre and song.